For the past couple of months I’ve been reading George R R Martin’s A Song of Ice and Fire. It’s a fantasy series, based in a medieval-like world, with a twisting plot and lots of catchy phrases. Most popular phrase is “Winter is coming”, always used in key moments, emphasising it’s double entendre. Another one I caught is “A Lannister always pays his debts”, the Lannisters being (dooh) the bad guys. But.. are there more such phrases? I downloaded the first 4 books. Split the text into words. I build a tree in order to easily determine the frequent phrases (having a minimum frequency of 10 occurrences and a minimum length of 3 words). After constructing the tree and computing the frequencies, I moved the phrases into a list, so I could sort them based on a score (score = phrase’s length in characters * log(frequency)). Check the code here. So.. what are the top phrases? 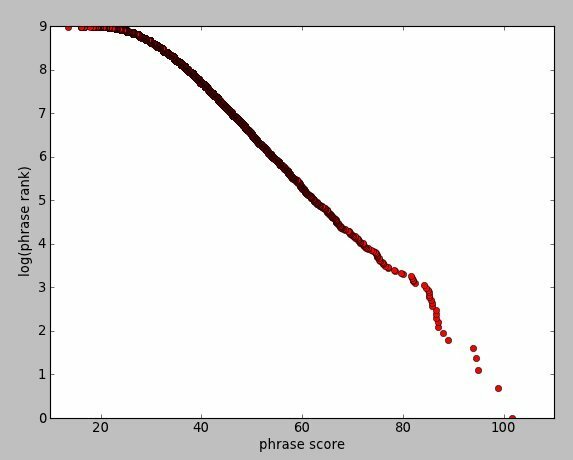 Changing the way scores are computed might improve (or not) the ranking of catchy phrases. Since I am looking for frequent phrases composed out of ordinary words, as oposed to some of the top 10 phrases (composed out of uncommon words – example: “grand maester pycelle”), I might use base word frequencies in the score equation. Another interesting idea is analyzing word distribution over the whole text (here).